Ferdinand Hodler (1853–1918), Rhythmic Landscape on Lake Geneva (1908), oil on canvas, 67 x 91 cm, Private collection. Wikimedia Commons. In the years before the First World War, Ferdinand Hodler still found time between commissioned murals and other major figurative works to develop his landscape paintings. Ferdinand Hodler (1853–1918), Landscape at Lake Geneva (c 1906), media not known, 59.8 x 84.5 cm, Neue Pinakothek, Munich, Germany. Image by Rufus46, via Wikimedia Commons. Painted in about 1906, Landscape at Lake Geneva continues his previous realist style, with considerable detail throughout the depth of the painting, from the flowers of the meadow in the foreground, to the textures of the distant mountain ridges. Ferdinand Hodler (1853–1918), Transfiguration (c 1906-07), oil on canvas, 110 × 64.5 cm, Von-der-Heydt-Museum, Wuppertal, Germany. Wikimedia Commons. 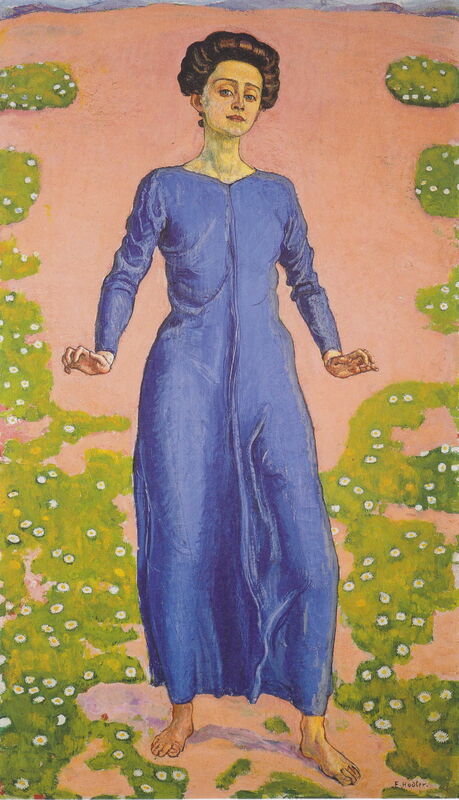 Transfiguration (c 1906-07) shows a similar motif to that in Song from Afar (1906), with the same model in a similar blue dress. However, this is more closely-cropped, and instead of her arms being held out, as if pushing away, they point downwards. In 1907, Hodler was commissioned to paint another large mural, this time for a new university building in Jena, showing the departure of students from Jena to the War of Independence against Napoleon, in 1813. Ferdinand Hodler (1853–1918), Spring (1907), oil on canvas, 102.5 × 129 cm, Private collection. Wikimedia Commons. Spring (1907) is a further version to the first from 1901, in which there have been small changes in the rendering of the two figures, and the background has changed completely to become a dense mass of yellow flowers. Ferdinand Hodler (1853–1918), Aareschlucht (1907), oil on canvas, 91 x 68 cm, location not known. Wikimedia Commons. Aareschlucht (1907) shows a spectacular gorge in the Bernese Oberland region of Switzerland, where the River Aare carves its way through a limestone ridge for about a mile. Its cliffs rise to 50 m (over 150 feet) above the bottom of the gorge, and it is not far from the Reichenbach Falls, which Hodler had painted at the very start of his career, in 1871. 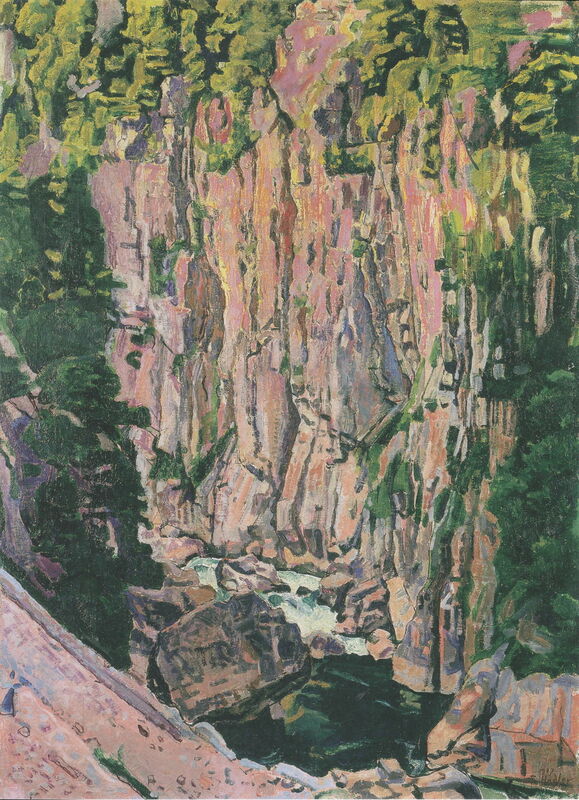 A walkway was constructed along the gorge between 1887-1889, but Hodler chooses to show the gorge from above. Ferdinand Hodler (1853–1918), Evening Mist on Lake Thun (1908), oil on canvas, 68 x 93 cm, Private collection. Wikimedia Commons. 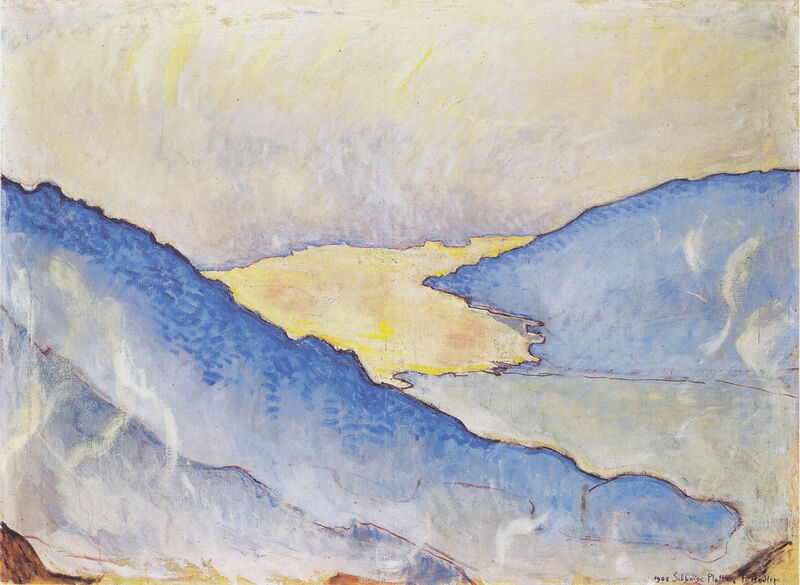 Evening Mist on Lake Thun (1908) is an early and clear example of Hodler’s late reduction of landscapes to their basic elements of form, colour, and light – a radical change from his previous emphasis on detail, and a marked contrast from Landscape at Lake Geneva above. Ferdinand Hodler (1853–1918), Eiger, Mönch and Jungfrau in Morning Sun (1908), oil on canvas, 67 x 91 cm, Private collection. Wikimedia Commons. This reduction is visible in this superb view of the Eiger, Mönch and Jungfrau in Morning Sun, which he also painted in 1908. Although the Eiger Massif is depicted faithfully, Hodler instills rhythm into the wispy clouds in the foreground. He also painted a companion view in moonlight which has more marked symmetry and rhythm. Most of his symmetry and rhythm is obvious; what may not be so apparent are the idiosyncratic reflections seen on the lake’s surface. 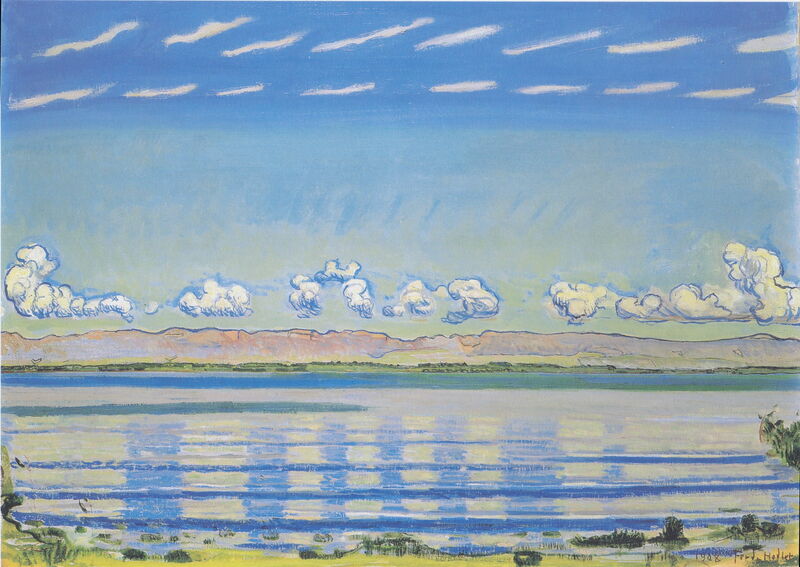 The gaps in the train of cumulus clouds here become dark blue pillars, which are optically impossible, but are responsible for much of the rhythm in the lower half of the painting. 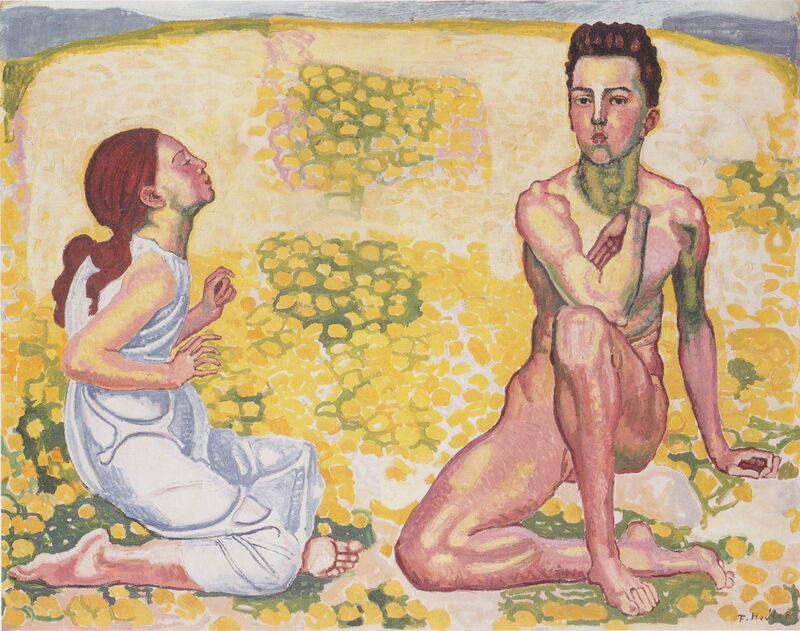 In the Spring of 1908, Hodler met Valentine Godé-Darel (1873-1915), a Parisian, who modelled for him at first, then became his lover, and an important figure in his later work. In the autumn, he was commissioned by the Swiss National Bank to produce designs for its banknotes, which he based on versions of his next major figurative works, The Woodcutter and The Reaper. 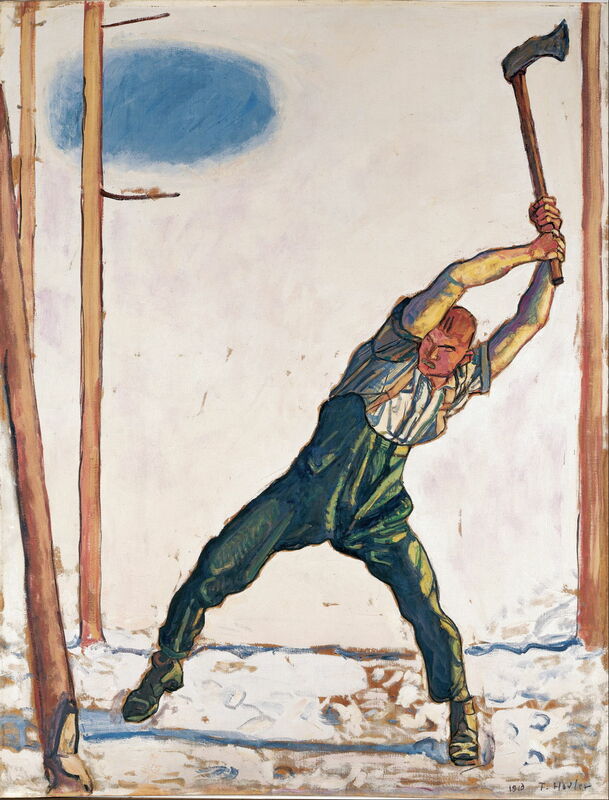 Ferdinand Hodler (1853–1918), The Woodcutter (1910), oil on canvas, 130.8 x 100.7 cm, Ohara Museum of Art 大原美術館, Kurashiki, Japan. Wikimedia Commons. 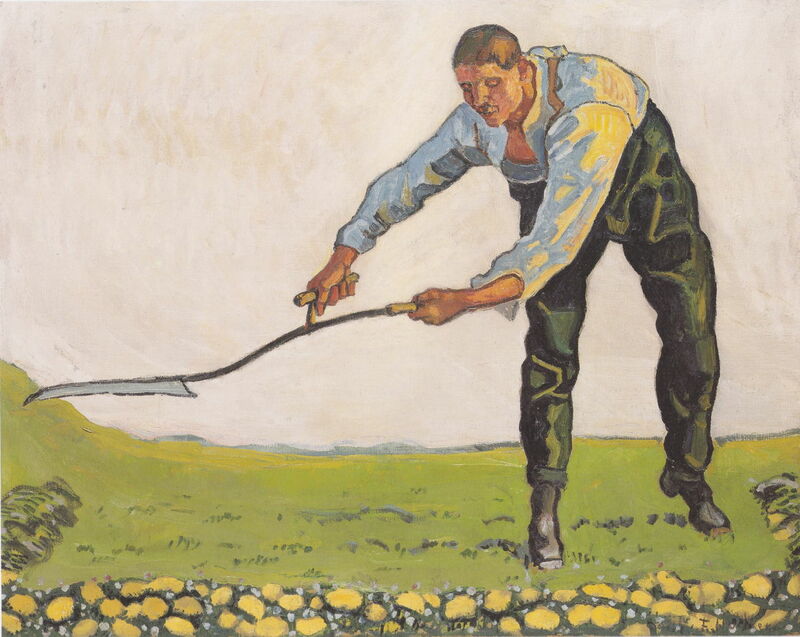 Hodler painted several versions of The Woodcutter (1910), above, and its pendant The Reaper (1910), shown below, before he could select those on which the banknotes were based. In both he has all but eliminated the distractions of his earlier paintings of similar figures, and placed emphasis on the form and movement of the figures as they work with their traditional tools at age-old tasks. Ferdinand Hodler (1853–1918), The Reaper (1910), oil on canvas, 83 × 105 cm, Private collection. Wikimedia Commons. In 1910, Hodler was commissioned to paint a mural for the staircase of the Kunsthaus in Zurich, which he based on A View to Infinity (three versions to 1905). 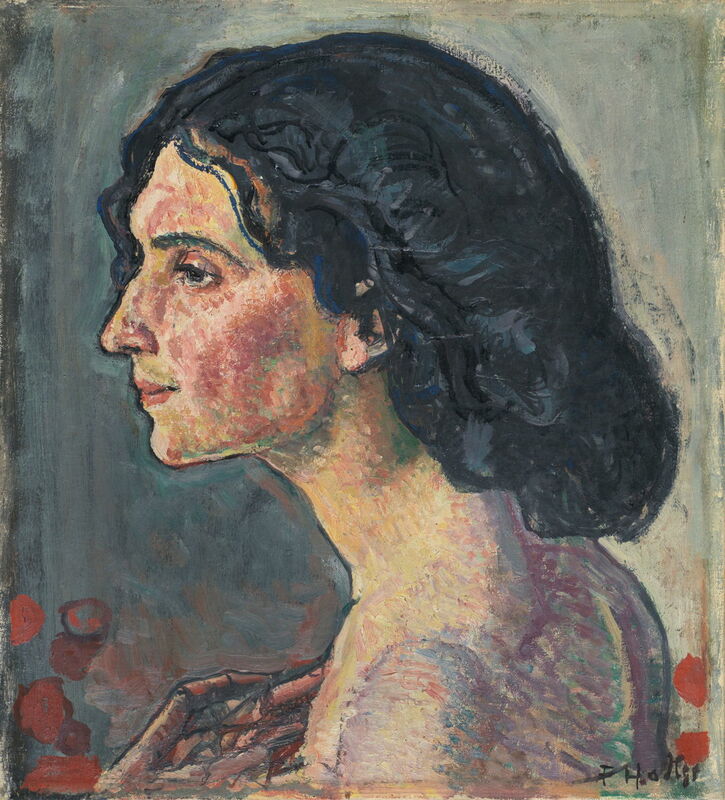 Ferdinand Hodler (1853–1918), Portrait of the Dancer Giulia Leonardi (1910), media not known, 34.5 x 40 cm, Wallraf-Richartz-Museum & Fondation Corboud, Cologne, Germany. Wikimedia Commons. Between about 1910-11, Hodler was fascinated by an Italian singer, guitarist and dancer, Giulia Leonardi. She played regularly in a café in Geneva, where they first met. 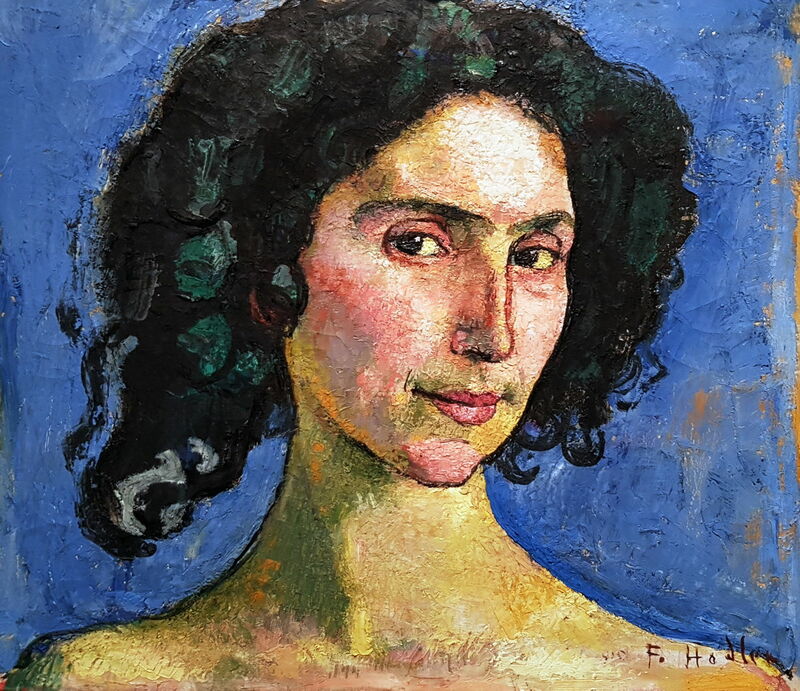 Hodler painted a series of portraits of her, of which Portrait of the Dancer Giulia Leonardi (1910), above, is perhaps the finest, with its carefully-worked skin tones and colours, and her coquettish look. A second Portrait of Giulia Leonardi (1910) is shown below. Ferdinand Hodler (1853–1918), Portrait of Giulia Leonardi (1910), oil on canvas, dimensions and location not known. Wikimedia Commons. Ferdinand Hodler (1853–1918), Lake Thun with the Stockhorn Range (1910), oil on canvas, 65.5 × 88 cm, Von-der-Heydt-Museum, Wuppertal, Germany. Wikimedia Commons. 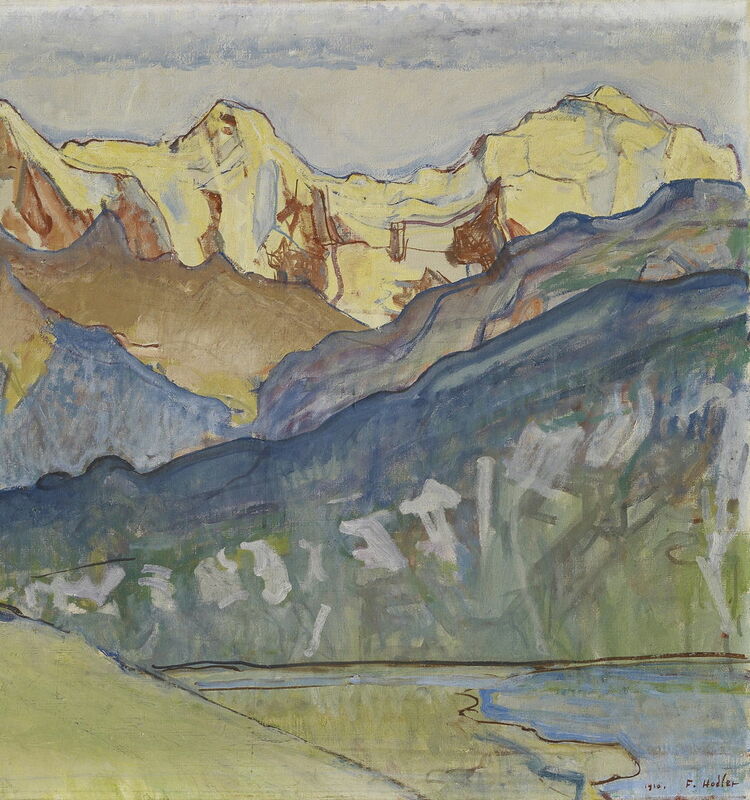 In the summer of 1910, Hodler was again busy painting landscapes in the Bernese Oberland. 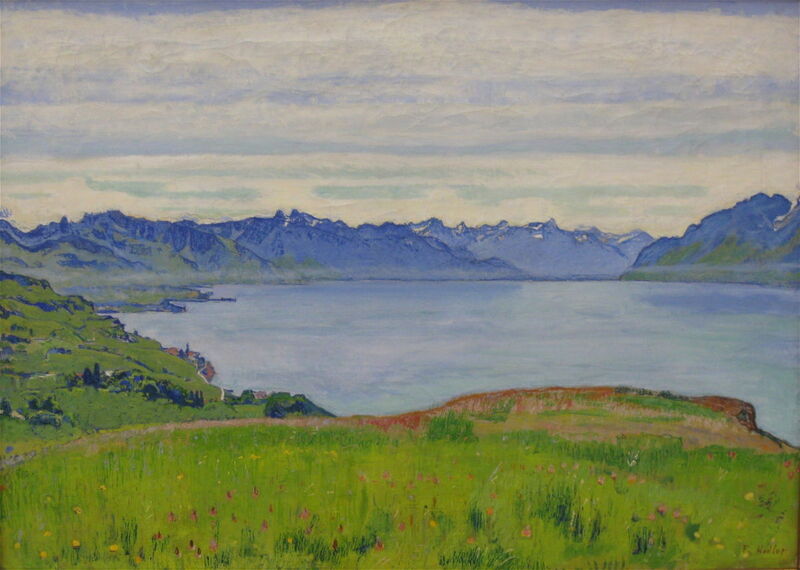 In Lake Thun with the Stockhorn Range (1910), he is on the north-eastern side of the lake, probably not far from the town of Thun, looking to the south-west over the lake at the Stockhorn and its lofty ridges. 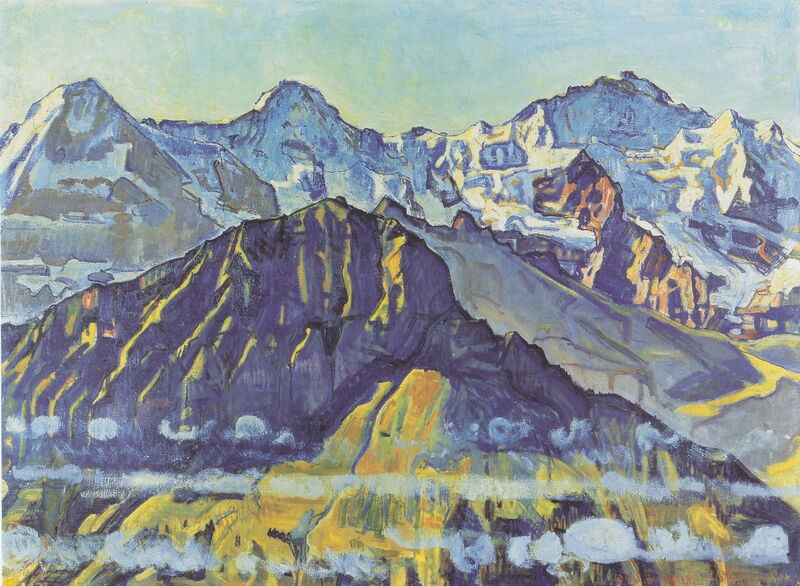 Ferdinand Hodler (1853–1918), Eiger, Mönch and Jungfrau from Beatenberg (1910), oil on canvas, 78 × 81 cm, location not known. Wikimedia Commons. 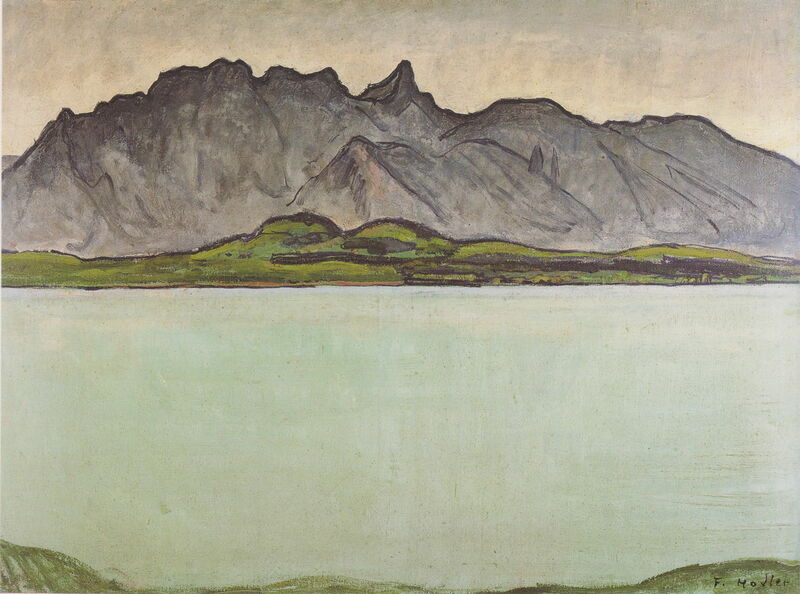 For this view of the Eiger, Mönch and Jungfrau from Beatenberg (1910), Hodler moved along the shore of Lake Thun, up to the small town of Beatenberg. He then looked to the south-east at the Eiger Massif, with the eastern end of Lake Thun in the foreground. The Lauterbrunnen road then passes from left to right in front of the Eiger and Mönch. His style has become significantly more gestural, with white marks resembling lettering on the foothills on the far side of the lake. The peaks themselves have been rendered in simplified form even when compared with his view in the morning sun from just two years before. The Eiger is notorious for its challenging ascent by the north face, which is that shown here and in the previous view. Although the mountain was first climbed in 1858, the route up the north face was not accomplished for another 80 years, and unsuccessful attempts continue to result in deaths. It rises to an altitude of almost four thousand metres (13,000 feet), of which three thousand metres (over 9,000 feet) are from the surface of Lake Thun. Posted in General, Life, Painting and tagged Hodler, landscape, painting, parallelism, realism, symbolism. Bookmark the permalink. Going for iCloud Drive, or the whole way with Desktop & Documents Folders?